A turkey-themed poster by Caroline Barnes. They often strike fear into the hearts of those who come across them: feathered foes known to attack people’s cars, chase down residents, and linger in the streets. But the turkeys that inhabit Brookline have also become part of the fabric of the community over the years. And for artist and illustrator Caroline Barnes, their presence around town is inspirational — despite the many complaints people may have. For more than a year, Barnes has been using the turkeys she runs into around town as her muse, creating colorful works of art based on her interactions. 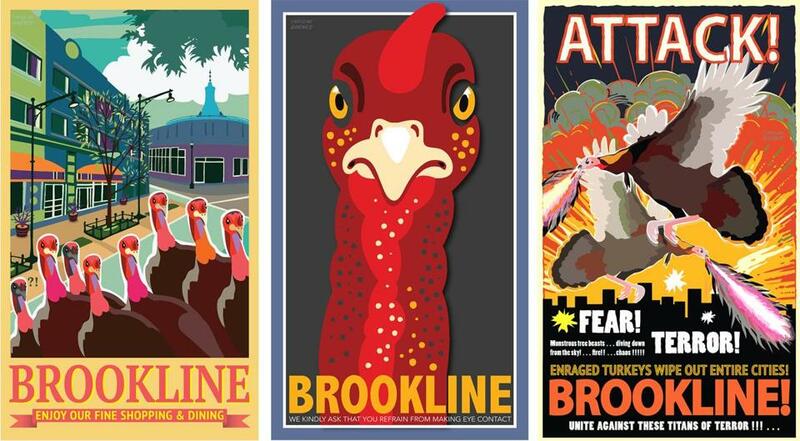 A collection of posters she’s made are now on display at Brookline Bank in Coolidge Corner, and she has two more events scheduled in the coming months where her turkey-centric art will be featured. The works are reminiscent of travel posters from the 1920s and 1930s. Some show angry-looking turkeys breathing fire, flying above the words “terror!” and “attack!” while others paint the birds more whimsically, walking alongside chicks, wearing fancy apparel, or even riding a bicycle. “Sometimes we take these birds too seriously,” she said. Barnes, a Brookline resident for nearly two decades, was inspired to start using the turkeys as the focus of her work based on their aesthetic and the way they’ve become a topic of conversation with residents. Turkeys have long been considered a nuisance by the residents. In a way, the abundance of birds has even become something of a running joke online, providing endless fodder for those who encounter the often-aggressive animals on sidewalks and in backyards. The Associated Press last year reported that as turkeys spread farther into urban communities, they’ve been increasingly at odds with humans, with complaints about the irksome animals surging over the last three years. In August 2017, Brookline officials even offered guidelines for how to handle a turkey encounter. State officials did likewise in April of that year.